Over the course of practicing family law for over 25 years (I started quite young, if you must know), the practice has been subject to various significant trends and changes. This is not your father’s practice. Some of these trends have been positive, some neutral and some quite negative. Let’s examine some of the main ones. Might as well start with a negative trend and get the bad news out of the way. Many years ago, a family law section board on which I was serving was told that Maricopa County, Arizona was experiencing a trend where nearly half their family law cases were pro se on at least one side. We were flabbergasted. There was no way a court system could survive with half of the litigants unrepresented. Yet, as it turned out, Maricopa County was just the beginning of the trend. Today, many counties have pro se rates as high as 50% on both sides, and 75% at least on one side. While the legal system has, indeed, survived, there has been a substantial cost. The one near and dearest to my heart and pocketbook (no, they are not one and the same!) is less revenue for divorce lawyers. While society as a whole is not likely to mourn this event, it has led to some unfortunate results. The court system, while continuing to operate, is less efficient. The competition for good clients and for getting paid is more intense, leading sometimes to unprofessional representation. And, perhaps worse of all, the number of calls received by lawyers to fix damages – usually too late – is increasing proportionately. The use of ADR – unheard of 25 years ago – has exploded. First, mediation became common, and often mandated, for custody and visitation disputes. Today, it is widely used for financial disagreements as well. In fact, many lawyers will not go to trial without at least suggesting some form of ADR to their client. Later, Collaborative Divorce made an appearance on the scene. While it has grown substantially, it has yet to become more than a boutique practice area, used only for relatively wealthy people with some degree of sophistication. Where issues such as debts, dishonesty, substance abuse or domestic violence are involved (are there any divorce cases not in one of those categories? ), the use of the collaborative practice is, at a minimum, problematic. Still, the concept of a lawyer as a problem solver and not as a combatant is a welcome trend. I was hired as an associate in my current firm out of the District Attorney’s office to be the firm litigator. My litigation experience was critical as a fair number of cases went to trial – and even those that eventually settled frequently entailed contested hearings and formal discovery. Today, thanks in no small part to the widespread use of ADR (see trend above), settlement rates range from the lower to upper 90 percentiles. 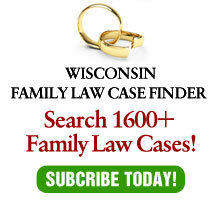 What has been called the “Vanishing American Trial” has become a family law trend, along with other areas of law. To quote that great American philosopher, Yogi Berra: “Predictions are difficult to make — especially about the future.” But, throwing caution to the wind, here are a few based on current trends. The first four predictions may or may not come true. The fifth one you can count on. This article originally appeared in The Family Lawyer.